Hope. Naomi and Ruth have hope. God has moved snd worked in such a way that they have seen the fulfillment of all that God had promised in their life. They can see hope. 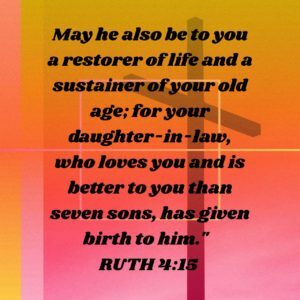 Read Ruth 4:15. A child has been born. This child represents the continuation of Naomi’s family and the fulfillment of all that God had promised to them. It did not happen the way that they thought it would, but God was still faithful and still fulfilled his promises. Often things do not happen the way we expect them. But, that never stops God from fulfilling what he wants to fulfill. We may see changes and distractions move and work through our lives, but are we trusting God to bring about exactly what He wants? That is the essence of hope. Hope is not a wish. Hope is a confident knowledge that what God has said, He will do. Do we have hope in the Lord today?